To gain entrance to a general's room you require 40 killcount of the respective army. For example to gain access to K'ril Tsutsaroth's room you would need 40 kills of Zamorak followers. While using Loot- or Coin-share killcounts from minions will be given to the person with the lowest killcount. For example player a, b and c are in a team using lootshare. Player a and b both have 40 killcount, but player c has 10. 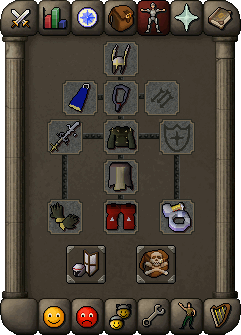 If player a, b or c kill followers of a god player c would receive the killcount until he has reached 40. Then it would be distributed equally between each of them once they are equal. Familiar (summoned): 52 summoning: Spirit Terrorbird (8 saras 4 rests), 67 summoning: War Tortoise (12 saras 6 rests), 96 summoning: Pack Yak (20 saras 10 rests). 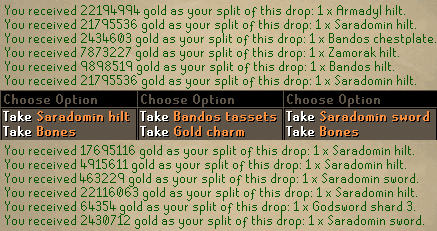 World 6 Bandos is a non lootshare, non coinshare team where the intention is to hit harder than everybody else, and thus getting the drop. The pros of this is that you can stay for an extremely long time (there are many people) and that it is quite cheap. Also if you do get a drop the profit is all to yourself rather than being split between several people. The cons are that without 99 melees and maxed equipment you will rarely get kills. There are two main setups for world 6 Bandos, these being the Void Knight melee set and bandos armor. Godswords are used in both cases. Same as tank, if you are high Defence (90+) and have a healing familiar bring super attack and strength potions. You can substitute this equipment with what you have. You must use a rune crossbow. Energy: as you're constantly running, your run energy will be constantly drained. To avoid this use a spirit terrorbird familiar, with the weightless run scrolls. They appear to stop you running, but Zilyana will still be unable to melee you. 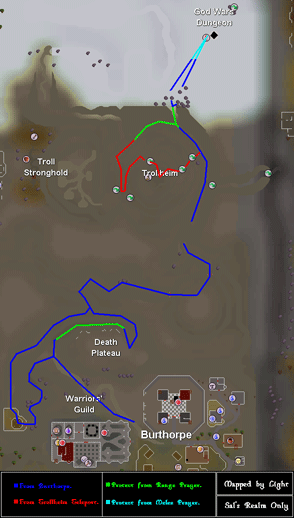 To get a full terrorbird past the waterfalls get your killcount in the upper area, then unsummon your familiar (which will drop it's 12 items) then run to the bottom floor and drop 12 items, then run back to the top floor and collect your items. Then run to the bottom floor, summon your spirit terrorbird, store the 12 items that were in it before and pick up the items you dropped. Familiar: BoB (beast of burden) preferably tortoise or higher. If using a healer familiar (elemental titan or unicorn stallion) bring the respective scrolls. It's inevitable that at some stage, you or somebody in your team will lag, disconnect, or simply not know what their doing and die. 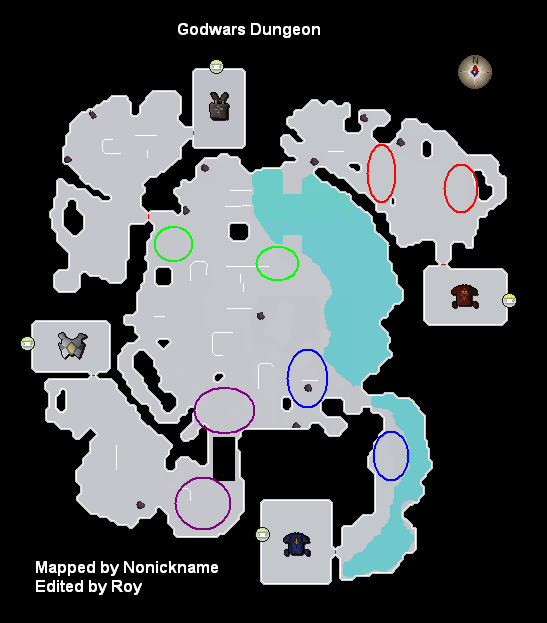 Keep in mind that what they lost is worth more than the 2 prayer potion doses you would use to bless them, and how you would expect them to do the same for you if you were to die. Q: If I die and log out (for any reason) will my grave disappear? A: Yes, and the items will be destroyed. If your grave was blessed before you log out the items will remain on the ground for the time the bless would have extended, but the grave will have disappeared. If you die before you have looted your previous grave the original grave will be destroyed along with the items for the new grave. If using Titan or Stallion bring Titan's constitution or Healing aura scrolls. Cast trollheim teleport, then climb down the rocks, crawl through the crack (or lift the boulder) and run into God Wars. You can either go slightly south of the entrance or inside the Eyrie. Inside the Eyrie is less crowded but the Aviansie there are slightly stronger. Attack Aviansies, allowing your bunyip to automatically heal you, or using Tian's constitution or Healing aura scrolls to heal yourself when damaged. If your familiar is out of special move points or you are on dangerously low hp use your spare food to heal. When your familiar expires drink a dose of summoning potion, and summon a new one.